3 What is Work Experience? An unpaid opportunity for young people to experience working life whilst they are still at school A chance for students to develop and practice new skills and become more confident in their abilities Can be non – vocational : it’s an experience of work! 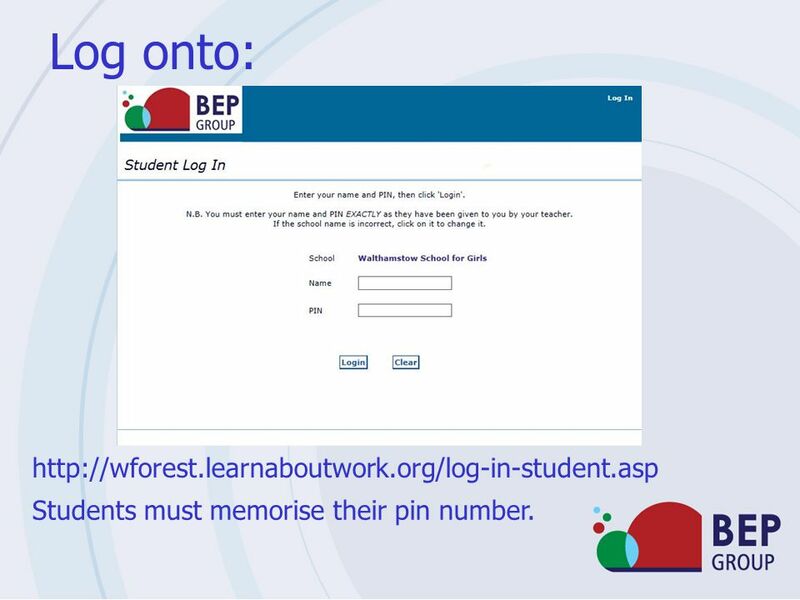 Students must memorise their pin number. 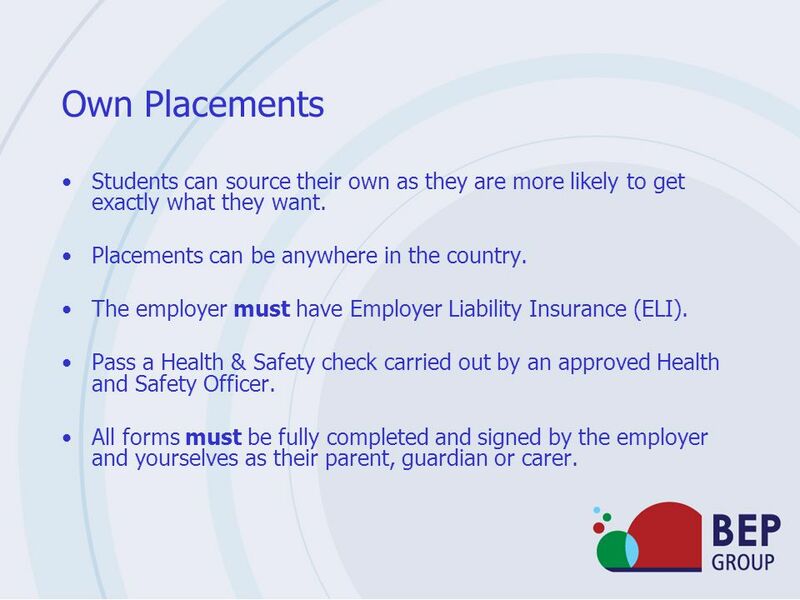 Make six placement choices and submit them in order of preference and by given date. 7 Things to avoid doing! 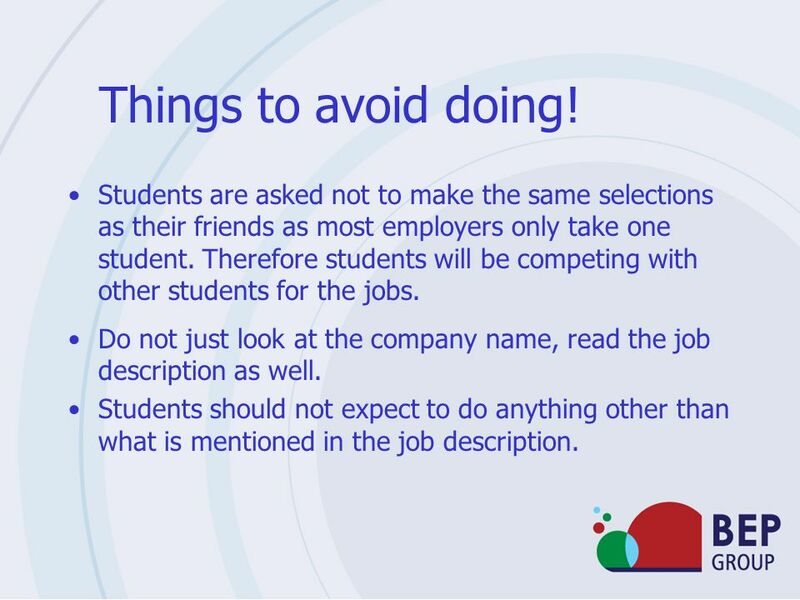 Students are asked not to make the same selections as their friends as most employers only take one student. Therefore students will be competing with other students for the jobs. Do not just look at the company name, read the job description as well. Students should not expect to do anything other than what is mentioned in the job description. 8 Own Placements Students can source their own as they are more likely to get exactly what they want. Placements can be anywhere in the country. The employer must have Employer Liability Insurance (ELI). Pass a Health & Safety check carried out by an approved Health and Safety Officer. All forms must be fully completed and signed by the employer and yourselves as their parent, guardian or carer. 9 After allocation. Allocated placements will be highlighted in green. 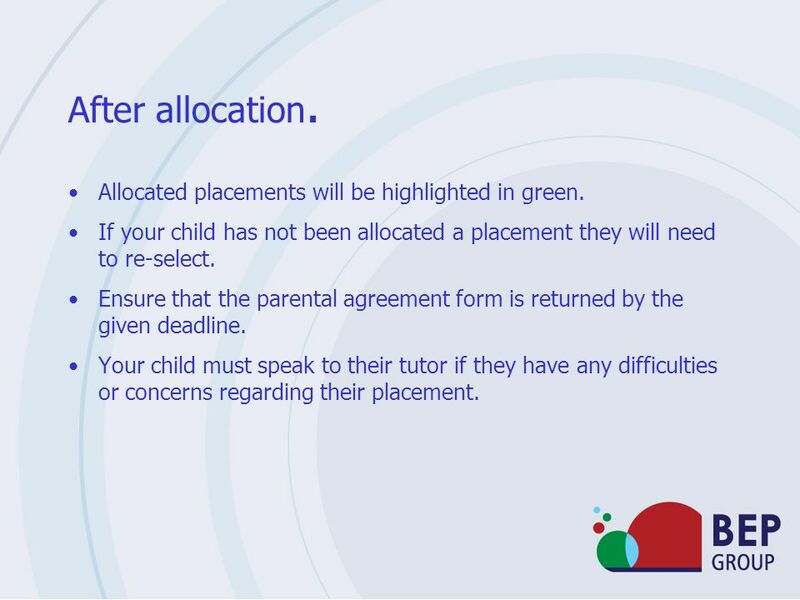 If your child has not been allocated a placement they will need to re-select. Ensure that the parental agreement form is returned by the given deadline. Your child must speak to their tutor if they have any difficulties or concerns regarding their placement. 10 Interview Once the placement has been confirmed students must contact the employer to arrange an interview. Employers will expect the student to arrange the interview and attend by themselves. This is an important part of the Work Experience Process, however if they have found their own placement, employers may not require a further interview or meeting prior to placement. In many cases – no interview, no work experience!!! 11 During the Placement Whilst on placement students will be treated as an employee by the company. Employers must be contacted if they are ill, running late or attending an appointment. They will be expected to work business hours. This is anything up to a maximum of 40 hours per week! 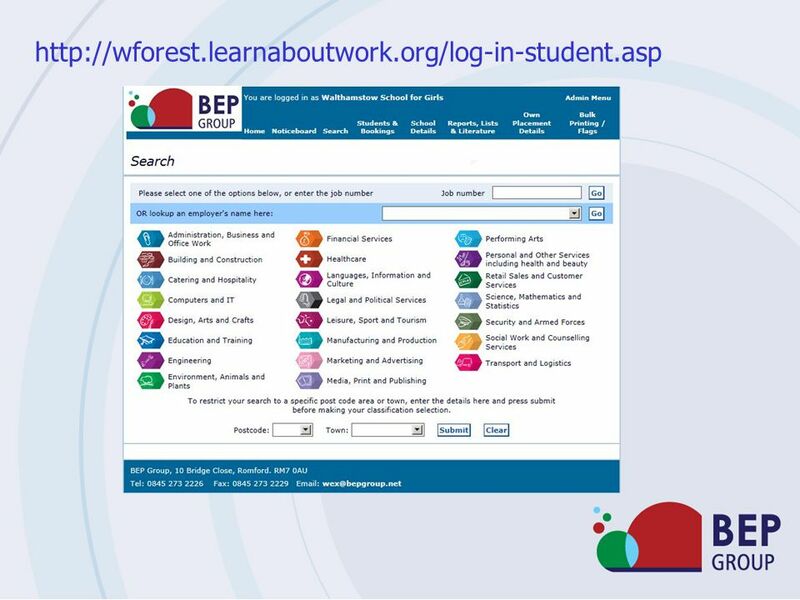 BEP Group will be advised if they do not attend placement and in turn will contact the school to find out where they are. While on placement! Students will be visited by a member of school staff. Remember there will be rules that students need to follow. 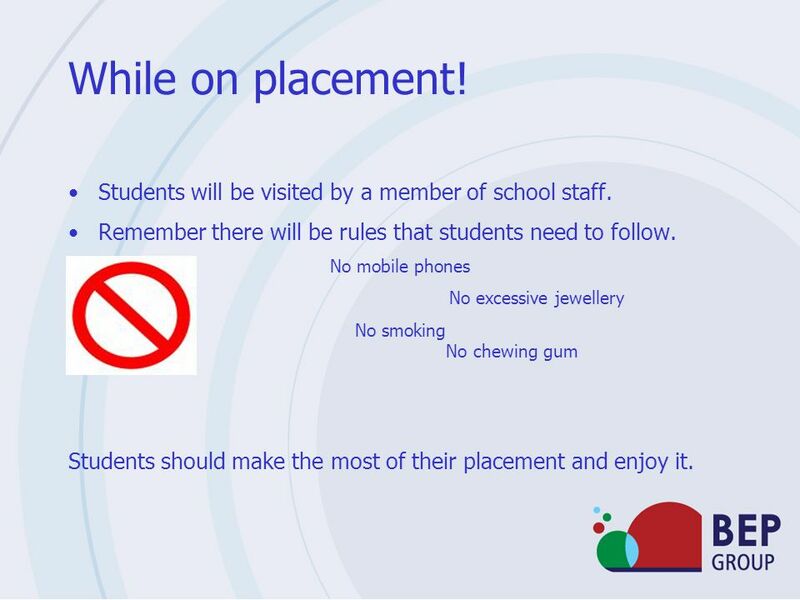 No mobile phones No excessive jewellery No smoking No chewing gum Students should make the most of their placement and enjoy it. 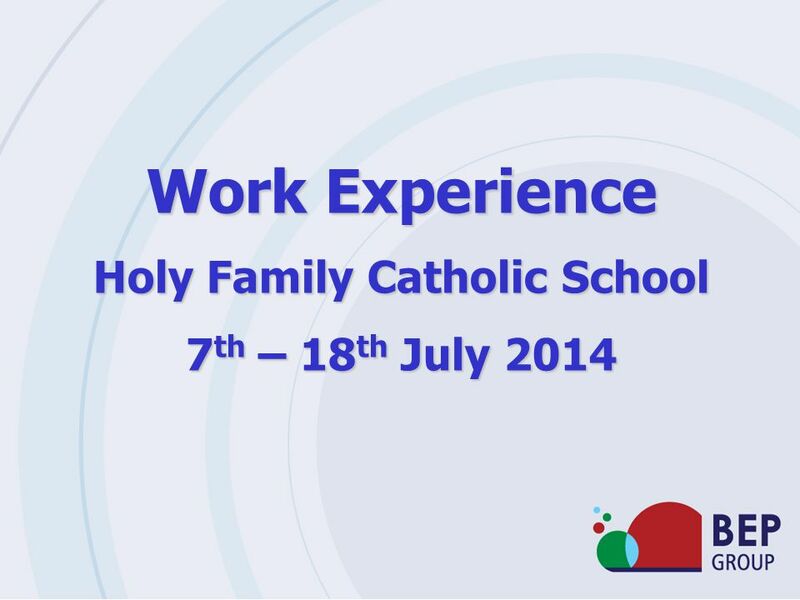 Download ppt "Holy Family Catholic School"
Work Experience Dates of Work Experience 2014 Monday 28 th April to Friday 2 nd May. How to Use the Work Experience Database w/c - 08/04/2013. Work Experience 2014 At the end of this presentation you will: Know about the aims of the Work Experience unit Know when the work experience week will. WORK EXPERIENCE Tuesday 6 th May – Thursday 15 th May 2014. MOULSHAM HIGH SCHOOL and HUMANITIES COLLEGE  Work Experience Tuesday 3rd January To Friday 13th 2012. Work Experience 2015 Monday 13 th – Friday 24 th April. Future Pathways 2015 Monday 1st – Friday 5 th June. Family Services Welcome to…. The presentation you are about see welcomes potential new Individuals and their Families to our organization and gives a.
Monday 7th – Friday 18th July 2014. Placement for Certificate IV in Youth Work Placement documentation, contacting agencies and reflective learning. 28 th March – 8 th April  Private placements must be submitted by Friday 10 th December 2010  A private placement form must be fully completed. RAISING ASPIRATIONS Work Experience Programme 13 th – 17 th July 2015. WORK MARR What is work experience? “A placement on an employer’s premises in which a student carries out a particular task or duty, or range. Career Pathways for English Language Graduates Liz Whitaker York St John University 16 th July 2008.